All interactive command prompts on a single machine use the same color. 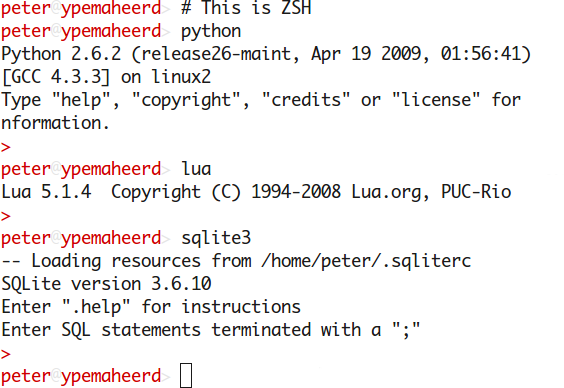 Every machine uses a unique color for interactive command prompts. 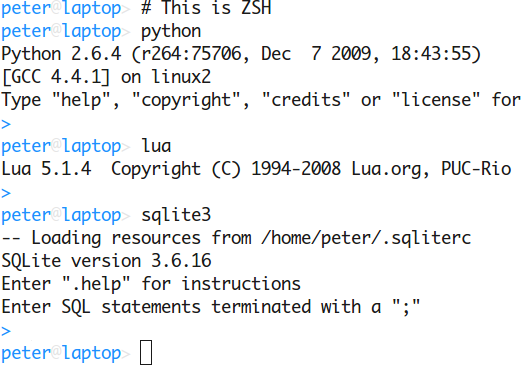 In my case the dotfiles for the Z shell, the Bash shell and the Python, Lua and SQLite interactive prompts are rewritten because I’ve added prompt definitions with ANSI escape sequences to the relevant configuration files. .prompt "[0;34m> [0m" "[0;34m>> [0m"
Uploading tarball to server1 ..
Uploading tarball to server2 ..
Uploading tarball to server3 ..
With a dozen dotfiles and three servers the script finishes within a few seconds. If you have questions, bug reports, suggestions, etc. the author can be contacted at peter@peterodding.com. The latest version is available at http://peterodding.com/code/sync-dotfiles and http://github.com/xolox/sync-dotfiles. Last updated Thu Dec 16 19:07:36 UTC 2010.